rec. Immanuelskirche, Wuppertal, Germany, 14-17 November 2012. In New Grove, Michael Talbot describes Andrea Zani as "an accomplished and fairly inventive composer", which seems about right, if based on limited evidence. Certainly Talbot did not have access to these cello concertos, which were assembled by Jill Ward, a postgraduate at Canterbury University (New Zealand), working on her Ph.D. 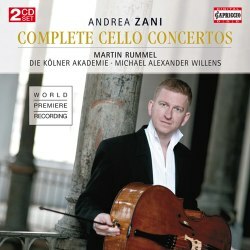 The collection then found its way in 2012 to Austrian cellist Martin Rummel at Auckland University, who immediately applied for, and happily received, funding to learn, practise and record the scores, all within the space of a few months. Five of Zani's Violin Concertos op.2 appeared a couple of years ago on the Swiss Pan Classics label, performed by Alessandro Ciccolini and the Compagnia de' Musici (PC10254). A decade before that, Giovanni Columbro and the Capella Palatina recorded Zani's op.4 Concerti Grossi for Agora (220), now an expensive rarity. These appear to be the only other monographs of his music. Elsewhere the odd concerto has appeared in anthologies, but very rarely. By coincidence, however, the brand-new third volume in Sol Gabetta's splendid 'Progetto Vivaldi' for Sony Classics (88697953502) includes Zani's A minor cello concerto (WD.789). All twelve works have the same fast-slow-fast (usually allegro/andante/allegro) structure that typifies the late-Baroque concerto, a short middle movement sandwiched between outer ones of roughly the same length. Zani was a younger contemporary of Vivaldi and these concertos show good evidence of the latter's benign influence, though whether Zani met him or not remains unknown, as indeed do many facts surrounding Zani's career. Amazingly for a not-quite-forty-year-old, this is Martin Rummel's 32nd commercial album. He has elected to play Zani in what appears to (and may well) be a random order, although there is symmetry between the opening and closing pairs. It does not make all that much difference - there is sustaining interest and variety in Zani's concertos whichever way round they come. Their colours are enhanced by the different continuo instruments employed by the excellent Kölner Akademie, their six violins, viola and cello augmented by a double bass, harpsichord alternating with organ and theorbo with guitar. Under Michael Willens, incidentally, Die Kölner Akademie are now four volumes into their historically authentic, in some eyes controversial, period instrument cycle for BIS of the complete (forte)piano concertos of Mozart with Ronald Brautigam. Sound quality is good, if just a mite reverberant, and accompanying booklet notes are detailed and informative. There are surprisingly few recordings of cello concertos from this period that are not by Vivaldi, especially of whole cycles like this one. That is an extra credit for this CD - the fine performances and Zani's own elegant, creative musicianship are grounds enough for procurement.